Thursday 31st. 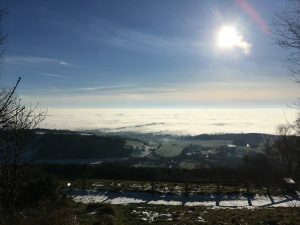 Freezing fog remained in place all day in the Vales of York and Pickering, but its northern limit was just to the south of Sutton Bank, which had bright sunshine all day and enough visible fields to allow flying to take place. 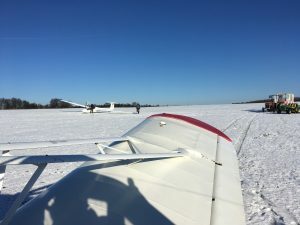 4 ATs resulted off runway 20 of the snow covered airfield, as Albert Newbery, Bob Spiller, Alan Beaumont and Ian Johnston each took a solo flight in K21 JVZ behind the Pawnee, the wind being a light E'ly. With no useable lift, flight times were in the range 15-22 minutes but the beauty of the views more than made up for the lack of soaring. John Carter has provided the following photos of the day. Friday 1st February. The wind had become a light to moderate N'ly that as well as limiting the maximum temperature to 1.6C also brought in a succession of snow showers that led to a deepening of snow on the airfield and prevented any flying. Saturday 2nd. The wind had backed into the NW and strengthened to moderate and this, in combination with further snow showers and a few inches of snow on the airfield, meant it was again a non-flying day. Sunday 3rd. 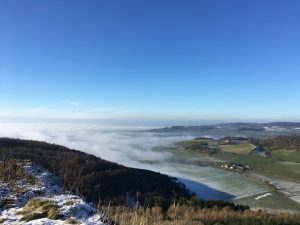 A transient ridge of high pressure resulted in a sunny start to the day, but an approaching depression led to increasingly cloudy skies as the SSE'ly wind slowly increased from light to light to moderate. The depth of snow on the airfield prevented any flying, so some members indulged in making snowmen while some instructors got to grips with the revised simulator operation. Monday 4th. The advent of a warmer air mass had resulted in the snow disappearing, with early cloud dissapating to leave sunny skies in a moderate NW'ly flow. A exploratory Eurofox launch found turbulent conditions on take off and landing and a consequential decision to leave the gliders in the hangars, so it was another day of instructor training on the simulator. Tuesday 5th. A moderate ESE'ly blew under cloudy skies, an exploratory flight in the Falke finding a layer of cloud at too low a level to allow for glider operations and, with cloud bases lowering as a front approached, it was another non-flying day, rain setting in later. Wednesday 6th. A light to moderate ESE'ly soon veered into the S producing some scattered orographic to form under a high cover. The extent of the orographic was not sufficient to prevent any flying and operations off runway 20 behind the Eurofox got under way around 1130 hrs, with John Carter and Ken Duxbury taking a 3k tow followed by some aerobatics. Some areas of zero off the southern ridge were found and used by them and subsequent pilots, extending flight times to around 30 minutes and with a list of pilots eager to get into the air, the DG500 was brought to the launch point to join K21 JVZ. Nick Gaunt took the first flight in the DG500 with John Carter and investigated that section of the main bowl between Gormire and the A170's ascent of Sutton Bank, finding some lift there during the latter part of their 36 minute flight.. George Rowden, taking off solo in JVZ just before John and Nick landed, initially found no lift on the southern ridge but on transferring to the main bowl found consistent if weak lift and climbed from 800' QFE to 2,300', landing back on runway 20 after 58 minutes and being accompanied by John Carter and Tony Kirkby in the DG500 for part of the time. Nick then took JVZ solo off the last flight of the day, coming off tow at 1,000' QFE and finding sufficient lift to maintain his height, explore as far as the forward ridge and land after 44 minutes as the light started to fade.